The first copies have been spotted in Toronto. In a bookshop of all places! An eagle-eyed friend send me a picture of what looks like a real huddle of books, two of which are brazenly facing out to show off a picture of my table, a little Duralex glass of coffee, my much loved Moka pot, a piece of a Roman Christmas cake called pangaillo (yellow bread), a bowl of oranges and lemons, and the words My Kitchen in Rome, Rachel Roddy. The picture came through with a beep and then it glowed through the screen breaking the absolute darkness in the bedroom at my parents house deep in the Dorset countryside. I have written another book I thought! I am prolific. Then I remembered it was the same book, just with another cover and title. A book that is now in a bookshop in Toronto and soon to be in more bookshops all over Canada, and on the 2nd of February in America. My American edition! I feel so international, and proud that my book has the chance to do what I have always longed for, that is travel to the other side the Atlantic. I haven’t seen a real copy yet, so my next thought was to check they had airbrushed the dirty mark off the wall behind the table, which of course they have. Wide awake, I came downstairs to write this in the middle of the night. Now the wind is howling what sounds like congratulations outside the kitchen window, I have a celebratory coffee in my hand, and feel very happy. The cover and name maybe be different, but inside is just the same, give or take the odd cup. Actually lots of cups, as the recipes have been patiently converted. The baking though is in both cups and metric, which is thanks to my testers and their conviction that offering both was right. I think we have also changed the words palaver and draining board. In short, little changes, but the book, whether Five Quarters with a sink, or My Kitchen in Rome with a table, remains the same. Many of you know the story. I didn’t intend to stay in Rome. I was set on returning to Sicily to finish the clockwise journey I’d interrupted. Then I visited a part of the city called Testaccio, which tripped me up with its cocky charm. I decided to stay for a while and rented a flat above a breadshop, across a courtyard from boisterous trattoria and seconds from the burly old market. My front door opened onto a narrow balcony overlooking an internal courtyard which was sort of vortex of cooking smells and vigorous Roman life. There is an Elizabeth Bowen quote (that we were given permission to use on page 252) pointing out the injunction to do when in Rome as the romans do is superfluous: what else is there to do? Of course I was going to eat pizza bianca just pulled from the mouth of a baker’s oven, flowers dipped in batter and fried until golden, carbonara, spaghetti alle vongole, gnocchi with tomato sauce, whole braised artichokes, bitter greens cooked with olive oil and garlic, wobbly cream puddings, wild cherry tart. Seasonal, uncomplicated, bold, and with flavours that are undisguised and definite: Roman food was a revelation. And I didn’t just want to eat these dishes, I wanted to try to understand them, to make them. I have always cooked and written, but the two met, collided really, in a small wind ventilated kitchen on Via Mastro Giorgio. I’d left everything behind in order to travel. I adopted a similar approach to cooking, allowing myself to watch, taste, experiment and learn things all over again, especially the blindingly obvious things. Such as how to make a soffritto, the simplest tomato sauce and bean soup, how to braise vegetables and meat in wine and their own juices, to boil pasta and soak chickpeas, all things I ostensibly knew how to do, but then again didn’t. Things that, once re-learned and better understood changed the way I cook. I cooked and kept notes, and cooked and kept notes. In 2008 my notes found a home here on this blog, and now seven years later a new home in this book. 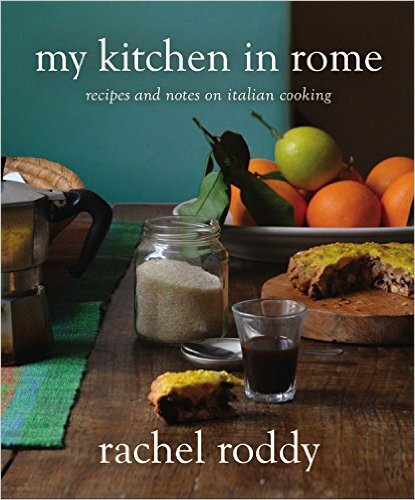 My Kitchen in Rome: Recipes and Notes on Italian cooking is the full name of the US/Canadian edition. Nick Seaton, a photographer whose work I like very much, came and more-or-less lived with us and our chaos for a days at a time in order to capture Testaccio. His pictures, which feel like acute sideways glances at this distinct part of Rome, are honest and beautiful and add another dimension to the book. The rest of the pictures are mine, taken over the course of the year in our small kitchen as I cooked my way though the seasons and the 120 recipes. Swelling the fact that a book is the hard, dedicated work of many, I now want to thank the team at Grand Central, especially my Editor Brittany McInerney. I would also like to thank my first editor Sara Weiss, the first person to approach me about a book, years before anyone else. Sara, you planted the seed. Above all though, Thank you to you, for reading, cooking, commenting and for the real sense of community that exists here. Without you, this book, in two editions, would quite simply never have happened. I know some of you have bought the UK edition, but for those of you who have waited long eight months, cheering me along all the way, you can now buy a copy if you wish, from a bookshop, or here on line. Please let me know if you do, one of the joys of the glowing, beeping,web is that so many of us can keep in touch, send me a message here, or on twitter, or instagram, I want to know. I am finishing my second book now, but just as soon as that is delivered I am planning to come the US, visit some bookshops if they will have me, and hopefully meet some of you. It all feels very exciting. I’d intended to post this week’s Kitchen Sink Tales yesterday, meaning Thursday, the day gnocchi is traditionally eaten in Rome. Of course you can eat them whenever the heck, or day you want. Having been the woman Artusi writes about – the one who puts her spoon in the boiling gnocchi pan to stir, only to watch them disintegrate like a soluble aspirin in a glass of water – but now having got the knack, I hope I share that. I would love to know your stories, both good and bad, also the types of potato that work best for you, wherever you are, the egg or no egg. I cannot sigh off without a deep, loving nod to Alan Rickman. Most actors (or in my case ex actor) have a tale set during their drama school years, when they queued for returns then sat thorough the same production half a dozen times, each performance more spine tingling than the previous. For me, it was Alan Rickman’s Anthony to Helen Mirren’s Cleopatra at the National Theatre in the late 90’s. I was hypnotized by his long, expressive face and body; both with a laid back seductiveness, and rich, resonant voice, somewhere between a purr, a snarl and a song, which came from almost disconcertingly closed lips. I can hear his voice now. Again in A Winter Guest at the Almeida, then films Truly Madly Deeply and Close My Eyes, he knocked me sideways. He was an actor who made me want to be an actor. Reading the tributes that are flooding in from those who knew him, all of which confirm his hypnotic brilliance, we learn too of his extraordinary loyalty, generosity, kindness, political integrity and boundless creativity. The world is a sadder place without him. It is going to sound naff maybe, but reading them, and thinking of AR has left me wanting to be kinder, more generous, more loyal and as creative as I can be. Back soon with a recipe. Bloody Kitchen Sink Tales, nothing for weeks, and then four of them come along at once, Cabbage, Chestnuts, Lemons, and Potatoes. Some of recipes will not be new for longtime readers here, especially Pasta e patate which I have written about several times, a reflection of how often I make it. Also in The Guardian this week was a piece from Bee Wilson’s New book, First Bite. I generally run a mile from the words diet and detox, even if they have the word No before them. My cautious self though, was glad to have read this wise, scholarly but human piece. Another piece I enjoyed very much was The smell of Loss by Julie Myerson. I am sorry that I am not writing here more. I could (happily) try to blame The Guardian, but really it is because I am accomplished at procrastinating and then write very slowly. I am also working on my next book, the working title of which is Two Kitchens, one being here in Rome, the other the one we have partly inherited in Sicily. I will be back here soon though, I have things to tell you about. Meanwhile, I am happy to announce that Luisa, Fabrizia and I are running the second edition of The Language of Food in June at The Anna Tasca Lanza Cooking school in Sicily. You can also look at the time-table here. You might like to read what I wrote last year, and the post Luisa wrote after our first edition, a most glorious week. It is a big commitment I know, but I hope that some of you may be able to consider it. Please feel free to write me an email if you want to know more. Lastly and most importantly, Happy New Year, I hope 2016 is as good as can be for you all. Thank you so much for your support this year, for reading and commenting here and over at The Guardian, for buying the book – the US edition of which is out in less than a month – for reading it and then splattering it with tomato sauce, hot fat or pasta cooking water. I mean it when I say I feel very fortunate. And the fifth thing, may I suggest boiling a whole orange for Claudia Roden’s Orange and almond cake. Quite aside from the cake it plays a part in, the smell as it simmers is stupendous, the truest sort of aromatherapy, just the thing for these long January days, maybe. That slightly rotten looking apple hiding in the picture, the one I nearly threw away, was such a good apple. It had that curious, sweet and musty ‘Granny’s attic’ smell, which transported me down to my parent’s cellar in winter when one wall is stacked with boxes of newspaper packed Bramleys. Two weeks in the bowl and the apple had wrinkled like fingers-in-a-bath into tight, sweetness and tasted of nuts and honey. I am not even sure what the variety was! I will have to ask the apple man at the farmers market on Sunday when I buy more. The oranges in the bowl were for Kitchen Sink Tales which you can read over at The Guardian if you would like. I have also written about winter tomato sauce and spaghetti. Ostensibly easy things, that are – I find – difficult to make well. This provokes quite strong views, all of which I am trying to embrace as I learn how to write for a newspaper. As Vincenzo would say, Coraggio, ideally with a glass of wine. This week I also mention George Clooney. You can read the article here if you like.